It's been out in Europe for more than five years, but today was the first time I've ever seen a Concord Neo stroller in person. 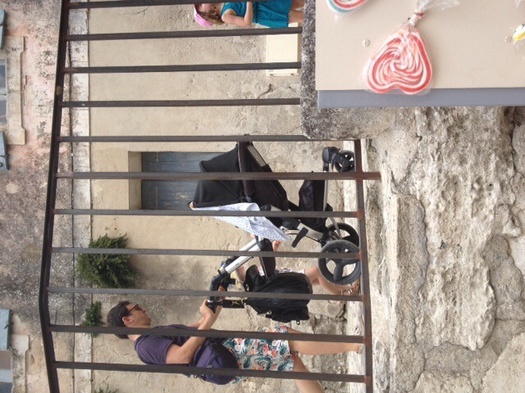 It was at Les Baux de Provence, a gorgeous tourist trap on top of a mountain. And the Neo was a lot of stroller. Seriously a lot going on, detail and engineering-wise. Like Yakuza dekotora minivan levels of things and pieces. Also the canopy is the same kind of spongy neoprene as much of the rest of the fabric. Nice finish, a bit unusual. 50 SPF, according to the company's website, but what opaque fabric isn't? It pushed smoothly, though I only saw it in the village, not traversing the rocks and gravel of the ruins nearby.